Sending text messages on a smartphone can change the rhythm of brain waves, according to a new study published in Epilepsy & Behavior. People communicate increasingly via text messaging, though little is known on the neurological effects of smartphone use. To find out more about how our brains work during textual communication using smartphones, a team led by Mayo Clinic researcher William Tatum analyzed data from 129 patients. Their brain waves were monitored over a period of 16 months through electroencephalograms (EEGs) combined with video footage. Dr. Tatum, professor of neurology and director of the epilepsy monitoring unit and epilepsy center at Mayo Clinic in Jacksonville, Florida found a unique ‘texting rhythm’ in approximately 1 in 5 patients who were using their smartphone to text message while having their brain waves monitored. The researchers asked patients to perform activities such as message texting, finger tapping and audio cellular telephone use in addition to tests of attention and cognitive function. Only text messaging produced the newly observed brain rhythm, which was different than any previously described brain rhythm. The blue boxes show the texting rhythm present in a 22-year old patient who is texting with her right hand. The unicity of the texting rhythm compared to other forms of mental stimulation could be caused by the combination of mental activity with motor and auditory-verbal neurological activity. No correlation was between the presence of a texting rhythm and the patients’ demographic information, including age, gender, epilepsy type, presence of a brain lesion on MRI, or ictal EEG. “We believe this new rhythm is an objective metric of the brain’s ability to process non-verbal information during use of electronic devices and that it is heavily connected to a widely distributed network augmented by attention or emotion,” Dr. Tatum commented. Next to smartphones, the texting rhythm was also found in iPad users. The researchers hypothesized that the presence of a different brain wave rhythm while using mobile, handheld devices might be caused by their smaller screens, which require more concentration. The article is "Cortical processing during smartphone text messaging," by William O. Tatum, Benedetto DiCiaccio and Kirsten H. Yelvington (doi: 10.1016/j.yebeh.2016.03.018). It appears in Epilepsy & Behavior, volume 59 (2016), published by Elsevier. Copies of this paper are available to credentialed journalists upon request; please contact Elsevier's Newsroom at newsroom@elsevier.com or +31 20 485 2492. Epilepsy & Behavior is the fastest-growing international journal uniquely devoted to the rapid dissemination of the most current information available on the behavioral aspects of seizures and epilepsy. 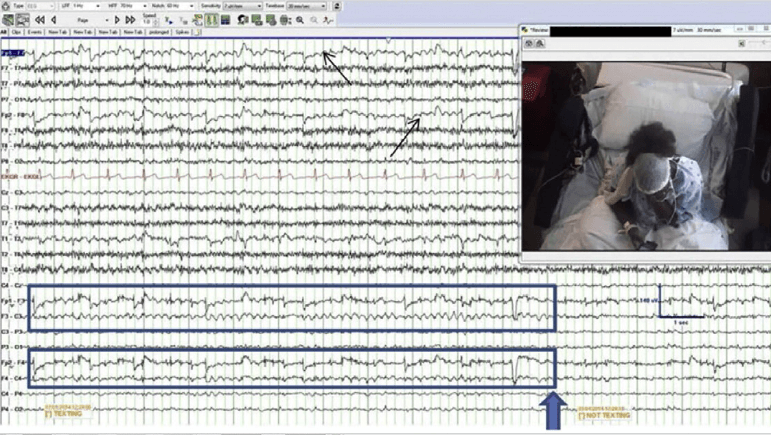 Epilepsy & Behavior presents original peer-reviewed articles based on laboratory and clinical research. Topics are drawn from a variety of fields, including clinical neurology, neurosurgery, neuropsychiatry, neuropsychology, neurophysiology, neuropharmacology, and neuroimaging.